With statistical maps of different datasets tested using same analysis pipeline, and the demography of each sample, users can perform meta-analysis to merge the multisite statistics using image-based or matrix-based meta-analysis. 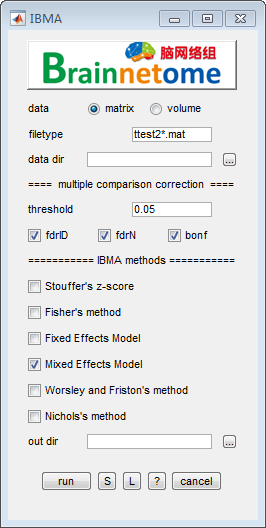 We have implemented Stouffer’s z-score method, Fisher’s method, fixed/mixed effects model, Worsley and Friston’s method and Nichols’ method. data dir: directory where all ttest2*.mat results are stored. center info: number of subjects for different centers. A csv format table is required. N1 and N2 is the number of subjects in each group. data dir: directories can be input either using a *.txt file or spm select window. Stouffer, S.A., Suchman, E.A., DeVinney, L.C., Star, S.A. and Williams Jr, R.M., 1949. The American soldier: Adjustment during army life. (Studies in social psychology in World War II), Vol. 1. Princeton University Press, Princeton,. Fisher, R.A. (1925). Statistical Methods for Research Workers. Oliver and Boyd (Edinburgh). ISBN 0-05-002170-2. Hedges, L.V. (1992). Meta-Analysis. Journal of Educational and Behavioral Statistics. 17(4), 279-296. doi: 10.3102/10769986017004279. Konstantopoulos, S. (2006). Fixed and mixed effects models in meta-analysis. Iza Discussion Papers. Worsley, K.J., and Friston, K.J. (2000). A test for a conjunction. Statistics & Probability Letters. 47(2), 135-140. doi: 10.1016/S0167-7152(99)00149-2. Nichols, T., Brett, M., Andersson, J., Wager, T., and Poline, J.B. (2005). Valid conjunction inference with the minimum statistic. Neuroimage. 25(3), 653-660. doi: 10.1016/j.neuroimage.2004.12.005. Salimi-Khorshidi G, Smith SM, Keltner JR, Wager TD, Nichols TE. Meta-analysis of neuroimaging data: a comparison of image-based and coordinate-based pooling of studies. Neuroimage 2009; 45(3): 810-23. Benjamini Y, Hochberg Y. Controlling the False Discovery Rate - a Practical and Powerful Approach to Multiple Testing. J Roy Stat Soc B Met 1995; 57(1): 289-300. Benjamini Y, Yekutieli D. The control of the false discovery rate in multiple testing under dependency. Ann Stat 2001; 29(4): 1165-88. Lazar NA, Luna B, Sweeney JA, Eddy WF. Combining brains: a survey of methods for statistical pooling of information. Neuroimage 2002; 16(2): 538-50.